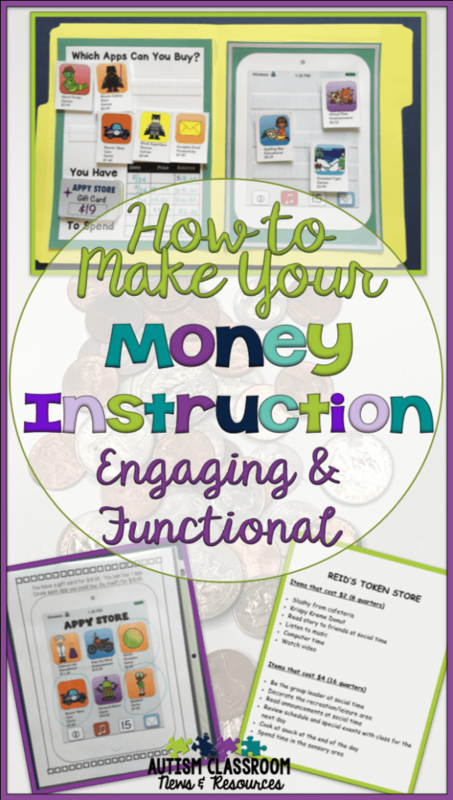 We all have some type of money instruction in at least one student’s day whether we are teaching elementary or secondary students. After a while though, we all get tired of teaching it the same way. In addition, our students struggle with taking our instruction and actually using it in the real world. We have a unique opportunity with money instruction because we CAN relate it to real life. It’s a direct line between learning about money and being able to use it to make purchases. So, money can be a really reinforcing thing to teach if we do it right. Students begin to understand it gives them power. And it makes them more independent. However, we often leave out the step of really relating it to real life. If we teach it like math instead of like a functional life skill, our students often don’t know how to use it successfully. We teach students to recognize coins and dollars; we teach them to count money and make change. We teach them that money buys things theoretically. But for our students we will be much more successful with instruction if students experience the real connection with money and purchasing. Sometimes we do this on field trips, but they may only happen once a month or once a quarter. And our students need much more practice to really learn a concept. So, what can we do? Here are some ideas to help spice up instruction and make it functional. One of the keys is getting students to understand what money can do for them–that they can buy things with it. And they don’t need to be able to make change to do that. Here are some ways (from simple to complex) to have students exchange. Even before you get to the Next Dollar up strategy, you can work on students exchanging money, making money a more interesting topic for them. Let’s face it, you can’t get stuff in exchange for reading…but money is a natural. You can give the student money to exchange for an item without having a price. You might have them sorting coins and then have them give you all the nickels to buy something. Don’t worry about giving specific amounts; start with just the exchange. This teaches them that money is valuable and they get used to exchanging money for items. If students can’t yet count with 1-1 correspondence, they can still buy something using a jig. A template or jig is something they can match the coins to that match an amount of money they need. For instance, if the vending machine costs 75 cents for a soda, have students find the coins that match up to a template of 3 quarters. 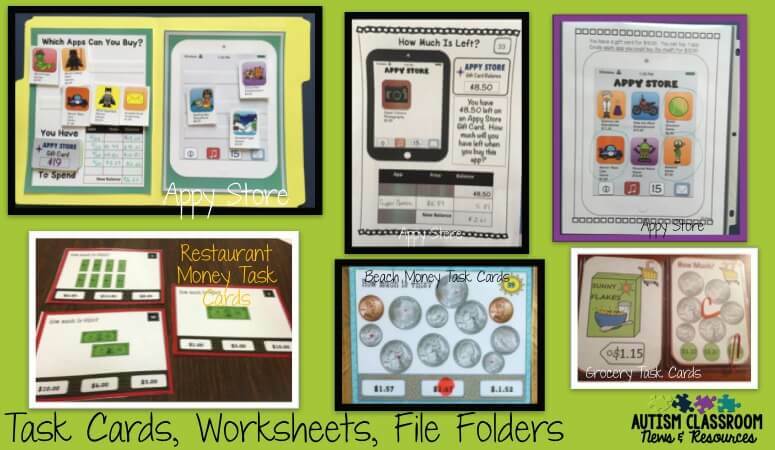 You can create a variety of templates using coins and/or bills. Then if students can match, they can match the coins and make the purchase independently. Click the image below to download a free set. If students can count with 1-1 correspondence, then they can count out bills or coins to make a purchase. You can have them make purchases for even dollar items or purchases that use a set number of coins. Then they can make a purchase without knowing how to count the amount of money but still working on counting. You can see an example in the picture and if you subscribe to the newsletter, there just might be a related freebie coming in it later this week. 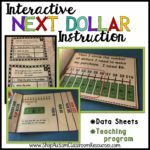 If they can count bills with 1-1 correspondence and match them to numerals, then the students can learn to use the next dollar up strategy. In this strategy students give one more dollar than the price. So, if the price is $4.25, the student gives $5. Let’s face of it, most of us don’t count change but have a general idea of what we should get. And we are more likely to count the bills than the coins. If a student can give one more dollar, then she can make a purchase. She can also determine if she has enough money to make the purchase. Then she doesn’t get to the clerk and get upset because she wants to buy something she doesn’t have enough money for. You can read more about Next Dollar strategies in this post. We often start teaching money by teaching coin identification and coin value. Discrete trials is really one of the easiest ways to do that. Typically we start by teaching penny, then penny and nickel, then penny, nickel and dime and then all 3 plus quarter. We can do the same thing with bills. The repetition works well for students to teach up the skills. 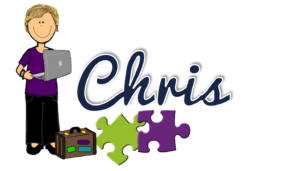 You can also bump it up and have them put money together to match prices, so combining coins, or coins and bills. However, it doesn’t really teach them the power of money. It just gives them the skill to understand money value and prices. Touch Money involves putting touch points on the coins and bills. Then teaching the students to use the touch points to determine value. As long as you fade out the touch points over time, this works well when students are first learning to combine coins and determine value. You can learn more about Touch Money at Pro-Ed. 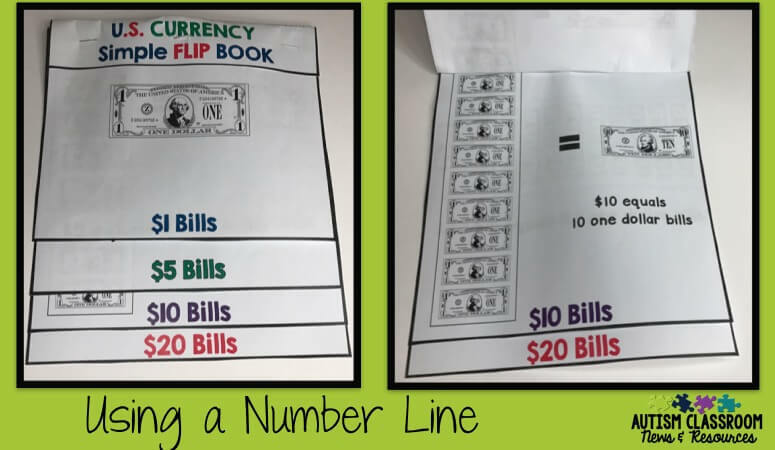 To teach students how to recognize more or less with money, you can use a number line. Teach students to recognize the numbers and that to the left is less than and to the right is more. This at least allows them to know if they have enough money for something. 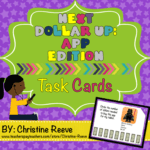 Once students are able to count coins, file folders and task cards are a great way for students to practice skills. You can have them match coins to prices, identify prices for items from flyers, etc. If you are using file folders, think about making it so that the students can’t memorize the answers. You can set it up so that you write the prices in so students are always working with different prices. Have them use a flyer so that prices change. I like task cards too because you can mix them up. That way students can’t memorize the order of the answer. Also look for materials that have differentiation built in. So, there are easier (2 identical coins) cards or folders (or worksheets) and cards/folders with more complex problems (e.g., mixed coins to add). This will make them more useful in the long term for new classes and allow you to individualize within your current class. 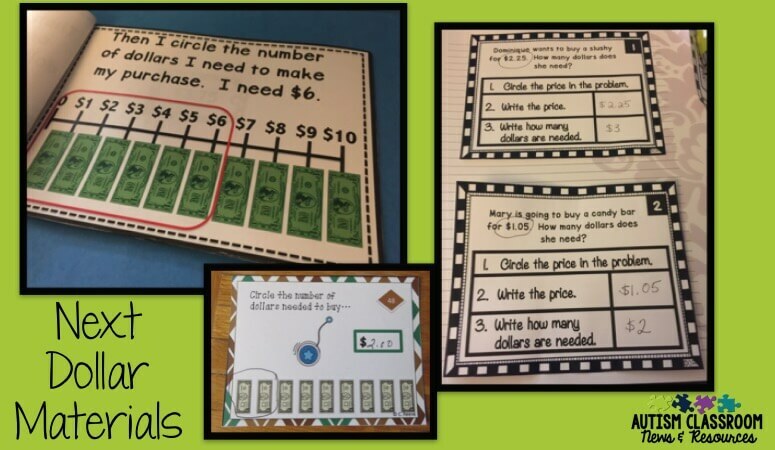 You can also have students do a variety of money-related independent work tasks to practice mastered skills. For instance, you could use this packaging task where students have to put in the amount of money called for on the tape. (click here to learn more about it). And of course worksheets, task cards and file folders work great in independent work. 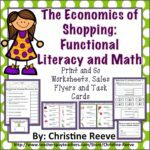 You can also stretch the concept of worksheets and task cards to create problems in which students have to figure out the amount needed to make purchases. 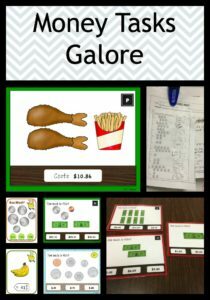 You can create word problems for shopping that will match many state or core standards for using money. You can then also stretch their skills to build in personal finance and money management by determining budgets, check-writing, debit-card use and matching money to sales flyers. So it’s all well and good that the students can now use money on paper, but it won’t have meaning until they start to make purchases. You can practice making purchases out in the community, and you should. However, rarely do we go out in the community frequently enough to get a good bit of practice that our students need to learn. So, here are some ways you can set up exchanges in the classroom to have lots and lots of practice. One of my favorite ways to work on money is to have students earn money (on a token system–like a jig), at even dollar prices ($2.00) or more complex prices (e.g., $2.85). I do it simply by putting prices on post-it notes and put the reinforcers on the post-it. I can put the reinforcers as the object on top of the post-it or write it on the post-it. The students either earn money for getting right answers during work or I give them a “bank” of money and we do multiple practices of buying reinforcers. The great thing about this option is that it is very motivating for the students because they buy something they want. 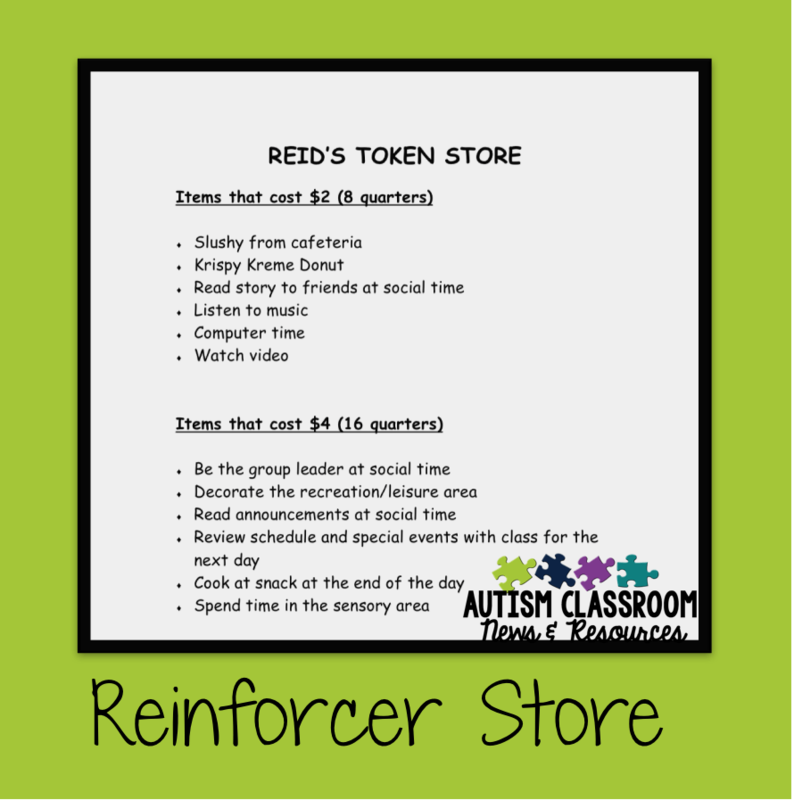 You can also use a reinforcer store with students’ token systems. 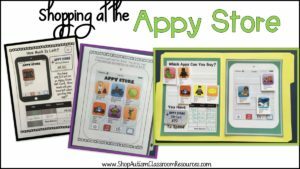 They can earn money and then spend or save it to purchase reinforcers from the store. You can see one above for a student who had the opportunity to earn 8 quarters throughout the day. He could spend it at the end of the day for lower level reinforcers or save them and use them the next day for more desired reinforcers. 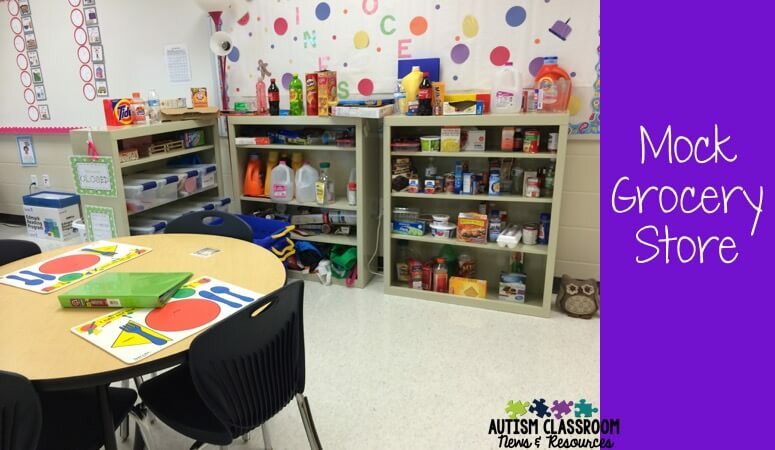 You can also set up mock stores in your classroom. You can see Ms. Gaines from East Ridge Elementary set up a grocery in the corner of her classroom. 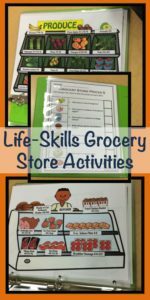 She used my Special Education Grocery Store Activities to add flyers, coupons and worksheets and task cards for the students to work on. If you don’t have room to set up a mock store with real-life empty containers like those in the picture, you can set up a store with pictures like those in Pete’s Grocery Store above. Either mount them on foam board or exhibit boards or just keep them in a binder and have students use them to find items on their list. There are many different things you can do with this set-up. 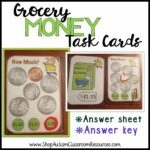 Have students make a grocery list and figure out how much money they need to shop. 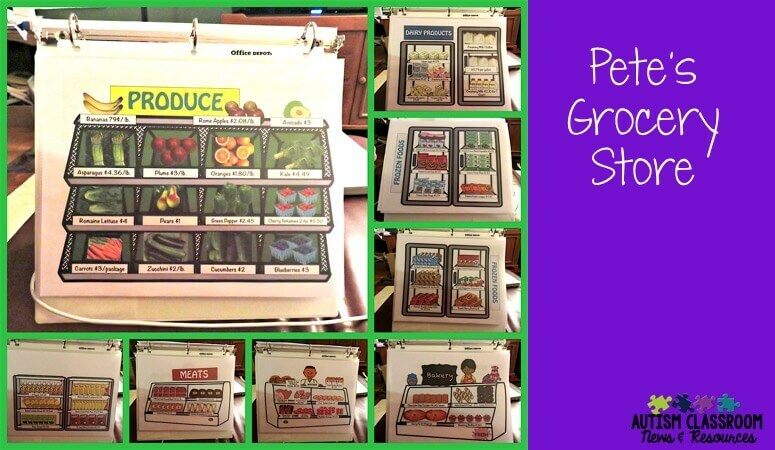 Have students find the items on a grocery list and put the prices down on the list. Have students find items and give them a specific amount of money on a debit card. Have them determine if they have enough to buy the item. Have students prepare for a cooking activity by reading the recipe, making a list of ingredients to shop for, find them and determine how much money they have to use. Have students practice writing checks and figuring out their balance to make a purchase. Have a student serve as a clerk so he or she has to make change when students make purchases. Even if your students aren’t on the job in the community, think about how you could “pay” them for completing jobs around the school. Then have them use that money to make purchases. To get the money to do this, think about a fund raiser or donations. I’ve also had schools that develop jobs at school for the students that earn money. I’ve had classes that make jewelry to sell, knit things to sell, sell candy at the end of the day in the school store, ran coffee shops or cafes for money for the class, and did laundry for staff for a fee. All of these can serve for a money source for students to earn a salary (even a small salary) that they can use to make purchases. Then you can work on banking, saving, writing checks etc. Clearly you also want the students to practice their money skills in stores and restaurants when they go into the community. Whether they are older students who make regular community trips or younger students who might make a field trip periodically, think about having them be in charge of some money to make purchase. The upcoming winter holidays are good times to practice this. Have them look in a sales ad to decide what they will buy someone as a gift. Then they can figure out whether they have enough money. Then they make the purchase. So those are just some ideas of how to teach students about money in a functional, meaningful way. 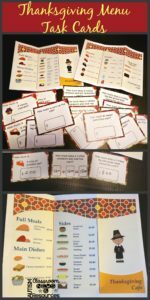 Below are some materials that might be useful in teaching money skills at different levels. Some of them are bundles that you can find the original items in. You can also click on any of the pictures in this post to check out my money activities. Or you can find them here. Finally, check below them to catch our Facebook Live discussion video from Sunday and come back next Sunday at 7 PM eastern on Facebook to join in. 1. Students earn tickets for finishing their work/jobs; at the end of the week they add up the amounts for each ticket ( $0.10; $0.25; etc.) then shop for toys, extra break cards, etc. 2. Students have classroom wallets with fake money. Everyday at snack the students must purchase their food and drinks using this money and the Dollar Up method. Both of these things have been great at helping my students. I love those ideas! Thanks so much for sharing them!